When launching the Fitbit Ionic smartwatch, Fitbit took the brave decision to go it alone. 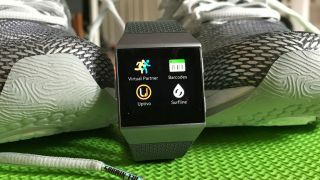 Rather than opt for a Wear OS watch offering access to the well-stocked Play Store, it released a watch running its very own operating system called Fitbit OS. We’ve seen many times in the past how difficult it can be to convince the mobile developer community to embrace platforms outside of the Apple and Google realm (see Windows Phone, BlackBerry, Palm and so on), but Fitbit is off to a decent start. While the company is starting from scratch, there are a limited but growing number of apps, Many are focused on health and fitness, including some crackers from Fitbit Labs itself. While Fitbit’s store is absolutely no match for the App Store and the Google Play Store you can still get some big names and some interesting additions from smaller, indy devs. Of course, at its core, this souped-up fitness tracker is still a watch. With watches come watch faces and there are plenty to choose from too. Fitbit has snared some pretty big names for the App Gallery. They’ll allow you to keep up with the news, control your home’s lighting, find a perfect place for a bite to eat and, of course, keep track of your activity. It’s not surprising that the Fitbit health and fitness app section are where the watch has the most interesting tools to download. Strava is already deeply integrated with Fitbit, so it’s no surprise to see Ionic and Versa wearers rewarded with a highly functional, brilliantly designed app for the smartwatch. The headline feature is Matched Runs. Every time you tackle on the same route it’ll automatically pull together key stats from your previous attempts. Of course all data is synced back to the Strava app, while also counts towards Fitbit credits. Although a certain president might disagree, the good old NYT is probably the most reputable news source on your Fitbit smartwatch. You’ll be able to scroll through headlines and scan story summaries to check on who said president has bonked, bombed or bamboozled today. Forgotten your gym membership card again? Have a wallet stuffed with store cards? The ingenious little Barcodes app allows you to input five numbers on your watch to create scannable barcodes. The app supports UPC-A (Universal Product Code) so you should be good for most barcodes in the US and the UK. Code-39, Code-128 and EAN-13 codes are also supported. Your heart rate while resting is just as important as your max output during exercise. Over time, a decreasing RHR shows you’re getting fitter and lowering your risk of heart disease. Anomalies can offer insight into your sleep, stress levels, the onset of illness or the amount of booze you sank the night before. This app shows your RHR over 7 days in a simple chart. “Well, where did you leave it?” said the most infuriating person ever as you struggle to locate the car before the grocery bags (or your elbow joints) give out. With FindMyCar you can mark the position of the car (or anything really) and make your back via GPS and following an on-screen display. Ok, this isn’t what you think it is. It’s not an AI-style girlfriend/boyfriend that vibrates just at the right time, it’s a virtual RUNNING partner. You can set a target time and distance and then go out and beat it… the virtual partner, we mean. This one’s simple, but effective. You can log the amount of water you drink and see visual progress towards your that goal each day. There are also one-touch controls for glasses, bottles and more. If you’d rather log beer, wine or tea DrinkCounter is also worth a look. Fitbit Labs’ own Tennis app uses motion sensors to track your strokes (forehands and backhands) and overhead swing. Of course, it can’t track volleys because how on earth does the watch know if the ball has bounced or not? If you desire, or your suspect someone of cheating, you can also keep track of match scores. Fitbit warns it might not be ready for Wimbledon, but it’s definitely a fun one to try. Fitbit’s own brain training game helps you hone your mental sharpness. The two-minute activities require you to switch between tasks quickly, with the goal of improving your cognitive flexibility. Tracking your performance over time allows you to see how your sleep patterns affect your score. We’re all about gamifying activity and TreasureTrek will reward your steps with sunken pirate treasure. You can use that booty to upgrade your ship and crewmates an even buy pets that’ll allow you enable you to make unique discoveries. Sadly there’s no rum at the end of it all. You want to choose a watch face that reflects your style, and with hundreds of choices now available for the Ionic and Versa you should be able to find something that fits the bill. There’s a huge selection of digital, analogue and somewhat leftfield designs for you to choose from. If functionality is as important for you as looks, then you can also choose from a range of watch faces that deliver stats right on your smartwatch's home screen. Do you miss the Tamagotchi pet you brutally neglected as a 90s child? Now you can redeem yourself by adopting a digital pet that’s kept alive by you meeting your step goals. Think about taking the dog for a walk, only the dog leaves you if you forget. There is an option for cat fans too, but sadly nothing for hobbyist trainers of lions or circus elephants. This one’s really cool. You can compete with your friends and view respective activity progress on a Mario Kart-style map showing everyone’s positions. Double tap the screen to see step counts in real-time. This one’s 99¢, but you can try it free for 24-hours. “Wait, you spent all that money on a smartwatch, just to make it look like something from the 80s?” we hear you ask? Yes. Yes we did. This app offers a range of classic digital watch faces including the iconic Casio face we all spent forever playing with as kids. You can even customize the activity stats shown in the corner. Sorry Fitbit, it just looks cooler. There’s loads and loads of ways to view your steps and heart rate, but as an irredeemably obsessed runner this simple clock face is my favorite. The race number design changes color depending on how you’re doing against your step target too. Who doesn’t want to look at Monsieur TheBeef every time they check the clock to see if it’s lunchtime yet? If you answered “Um? Me” to that question, then I’m afraid we can’t be friends anymore. What do we want? Visual representations of progress! Where do we want them? On our wrists! If you’re a data fanatic who can’t get enough info, this watchface will allow you to track four data points at a time, while showing progression towards goals. Don’t actually want to know what the time is? Binary turns a simple task into a test for your brain by converting the clock to Base 2 numbers (whatever those are). Looks pretty on your wrist though. Do you know whether you have a waterproof Fitbit?